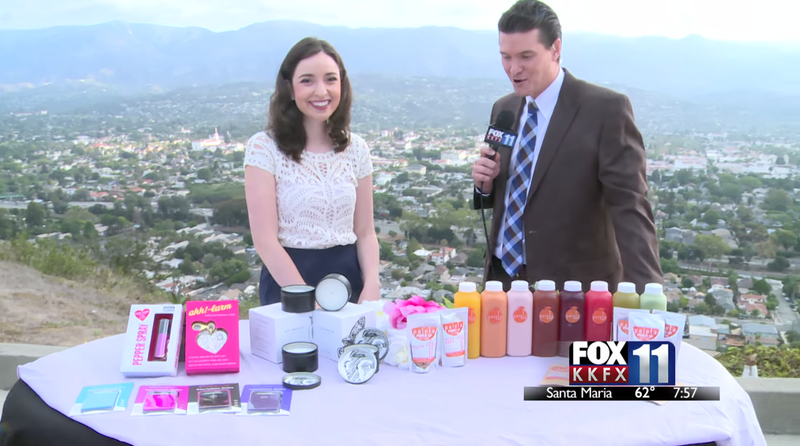 Congratulations to our Clients Blingsting, CardNinja and EJH Brand for their feature on Fox 11 News! It’s Back To School time and Fox 11 News has some great essentials for your college students.Â Blingsting wants women to be safe both on and off campus, while still feeling stylish! Their bedazzled pepper spray clip-ons and Ahh!-larm keychainsÂ do just that. Both items clip on the outside of a purse or backpack to allow easy access in case of emergency. Now you just need to decide which color to snag for yourself! Check them out at blingsting.com! College students can grab just their StudentÂ ID and some quick cash before running off to class thanks to the CardNinja. This handy device sticks onto the back of your phone or phone case, just like a sticker, and acts as a wallet. It keeps your cards and cash secure. Find out more at cardninja.com! Transform your dormÂ with Signature Travel Candles by EJH Brand! The scent of fresh lavender is immediately calming, and the 100 percent pure essential oil and no toxic additivesÂ will make theÂ air as fresh and healing as it smells. Simply light the candle and your room will take on an aura of sanctuary. Check them out at ejhbrand.com!